Modern industry and society are intrinsically linked to energy production, delivery and consumption. Hence, energy transition has repercussions across business decisions, policy objectives and consumer behaviour. It is therefore more important than ever to carefully steer the transformation towards a future energy system that delivers an optimal balance across the three triangle imperatives: economic development and growth, universal access to secure and reliable supply, and environmental sustainability. What does “effective energy transition” mean? Effective energy transition is a timely transition towards a more inclusive, sustainable, affordable and secure global energy system that provides solutions to global energy-related challenges, while creating value for business and society, without compromising the balance of the energy triangle. Achieving simultaneous improvements in these three areas is not trivial or straightforward, and decision-makers will sometimes be faced with hard choices and trade-offs. Specific actions will not always be complementary and synergistic, and outcomes will differ based on countries’ circumstances and priorities. For example, emerging economies need to meet rising industrial and residential demand under the constraints of environmental sustainability, and some resource-rich countries will need to diversify revenue to reduce dependency on fossil fuel exports. At the same time, countries will need to carefully manage system reliability and labour issues resulting from the changing energy mix, and markets will need to evolve to efficiently integrate new technologies and solutions while coexisting with legacy infrastructure. Businesses need to prepare for the impact on their existing business models from new technology, system solutions, consumer expectations and policy environment. While energy transition presents opportunities to optimize the allocation of resources through the adoption of new technologies, create jobs through new business models and reduce environmental footprints from the energy value chain, it also poses risks of socioeconomic shocks from ill-informed decisions. Energy transition can be viewed from multiple lenses. The challenge is not restricted to lowering the carbon intensity of the energy supply, or the electrification of transport, or the efficient consumption of energy, or harnessing the potential of digitalization and decentralization. It is rather a complex process with multiple interactions and feedback loops between these transformational cues and other elements of the economy and society. In that light, the design of the energy transition requires a broad interdisciplinary mobilization of expertise, convictions, resources and multistakeholder collaboration. To better inform decision-makers about the competing nature of energy transition end objectives and the state of interdisciplinary forces at play, a robust fact base is necessary to understand the status quo and to identify systemic reforms that will enable an effective energy transition. The proposed analytical fact-based framework does not only allow countries to benchmark the performance of their energy system, but also assesses countries’ readiness to address the opportunities and challenges of energy transition. Building an optimal energy system requires a tailored approach. Necessary actions for improvement will differ based on country-specific factors, including – but not limited to – socioeconomic growth priorities, natural resource endowment, demographics, dependence on energy imports/exports, depth of capital markets, business climate, etc. However, at its very core, the energy system is expected to serve three imperatives at the country level, which can be used as levers for global benchmarking (Figure 2). As an input to a wide array of industrial processes and residential applications, energy is a driver of economic and human activity. Universal access to a reliable and secure energy supply is a crucial element of a well-performing energy system. The security and reliability of the energy supply need flexible and resilient infrastructure, a diversified supply base, and governance and emergency response mechanisms to hedge against geopolitical, technological and financial risks. Given that energy is still coupled to economic development and growth, countries will need to carefully approach security and reliability while maintaining affordability to ensure that their citizens can access public services and industries can remain competitive. A strong energy system also contributes to economic output and employment, and generates fiscal revenues. Moreover, given the challenge of reducing the environmental footprint of the energy value chain, countries will need to optimize security, reliability and economic growth while investing in the integration of low-carbon technologies and the minimization of negative environmental externalities. There is no single way to deliver across the three key imperatives, and each country will define its own pathway. Moreover, evidence suggests that not all countries can simultaneously achieve the theoretical maximum on each dimension. The analytical framework devised improves decision-making while acknowledging the trade-offs. The success of country-specific actions for improving energy system performance across the three aforementioned imperatives depends on a wide set of enablers. For the purpose of our framework, “transition readiness” refers to the degree to which a country’s energy system has the political, economic and social structures in place to allow a transition to a more secure, reliable, inclusive and sustainable energy system that fosters greater economic development. A thorough understanding of these structures as well as the degree of improvement potential therein are essential to ensuring an effective energy transition. 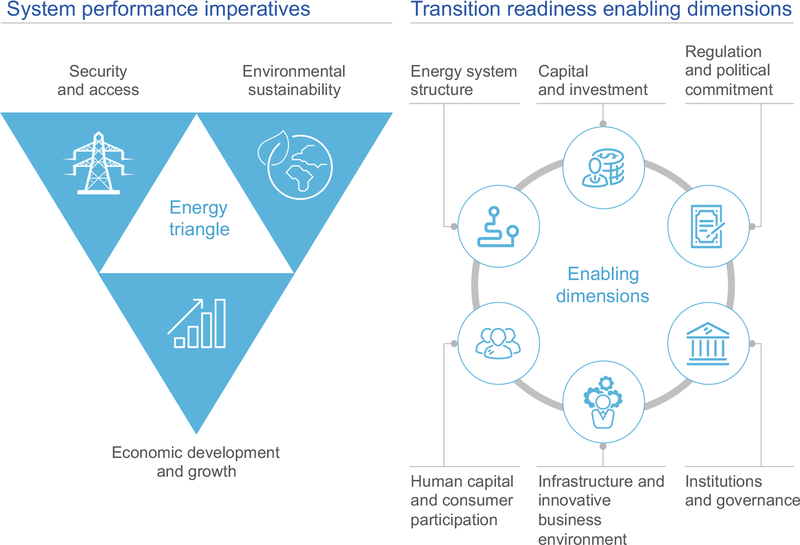 The transition readiness component presented in this framework identifies key enablers and supports decision-makers in prioritizing actions towards creating a robust enabling environment for energy transition (Figure 2). The extent to which a country is ready for transition is primarily determined by existing energy infrastructures, the credibility and stability of long-term political commitments, and the availability of capital to finance the energy transition. Regulatory frameworks need to balance the need for providing certainty while showing flexibility to effectively integrate new technologies and business models when dealing with existing structures. An effective energy transition also relies upon a working market design, investment attractiveness, multilateral partnerships and the presence of a dynamic environment of innovation. Above all, energy transition has societal implications and, in the end, consumer behaviour will determine the acceptance of future energy systems. Although there is no one-size-fits-all solution, regulatory frameworks should take (long-term) country visions and entire value chains into consideration. Reforming a market is complex, subject to historical legacies and influenced by existing dynamics. Inefficiencies that increase system costs or pose a risk to energy system functionality are not necessarily avoided by a market redesign and may put investments at risk. The forced unbundling of the power sector to create transparency and promote efficiency in the grid and generation businesses, the opening up of power generation (and retail markets) to competition, and auctions for new capacity in conventional and renewable energy are becoming the new normal. Shorter (e.g.15-minute) intraday auctions (as introduced by Germany in 2015) can better match the production of intermittent renewable generation, and in particular the ramp-up and ramp-down of solar generation. Different sources of flexibility (distributed generation, including microgrids and minigrids, batteries, demand-side management) should be allowed to compete in the market for offering ancillary services (as is already happening in the United Kingdom), by removing current regulatory barriers. However, this process is continuously evolving. Europe, often seen as one of the more advanced power markets, is now in the process of reinventing itself with the Energy Winter Package debate. The key question remains how to ensure regional coordination while sufficiently considering national circumstances and ensuring economically viable investments. However, reducing energy intensity and capturing the full potential from energy efficiency improvements is challenging. 36 International Energy Agency, Energy Efficiency 2017, available at https://www.iea.org/publications/freepublications/publication/Energy_Efficiency_2017.pdf. 37 CNBC, “Governments are getting lax about improving energy efficiency, putting climate progress at risk, top policy advisor warns”, October 2017, available at https://www.cnbc.com/2017/10/04/nations-are-getting-lax-about-improving-energy-efficiency-iea-warns.html. 38 International Energy Agency, Energy Efficiency 2017. 40 McKinsey & Company Sustainability & Resource Productivity, “Pathways to a low-carbon economy: Version 2 of the global greenhouse gas abatement cost curve”, September 2013, available at https://www.mckinsey.com/business-functions/sustainability-and-resource-productivity/our-insights/pathways-to-a-low-carbon-economy. 41 International Monetary Fund (IMF), “Energy Subsidies in the Middle East and North Africa: Lessons for Reform”, March 2014, available at https://www.imf.org/external/np/fad/subsidies/pdf/menanote.pdf. 42 McKinsey Sustainability & Resource Productivity, Energy efficiency: A compelling global resource, March 2010, available at https://www.mckinsey.com/~/media/mckinsey/dotcom/client_service/Sustainability/PDFs/A_Compelling_Global_Resource.ashx. 43 For example, the shift from internal combustion engines to electric vehicles, International Council on Clean Transportation, “Literature review of electric vehicle consumer awareness and outreach activities”, March 2017, available at http://www.theicct.org/sites/default/files/publications/Consumer-EV-Awareness_ICCT_Working-Paper_23032017_vF.pdf. 44 International Energy Agency, Energy efficiency indicators: Highlights, December 2016, available at https://www.iea.org/publications/freepublications/publication/EnergyEfficiencyIndicatorsHighlights_2016.pdf. 45 McKinsey Sustainability & Resource Productivity, Energy efficiency: A compelling global resource. 46 World Bank, Regulatory Indicators for Sustainable Energy: A Global Scorecard for Policy Makers, 2016, available at http://documents.worldbank.org/curated/en/538181487106403375/pdf/112828-REVISED-PUBLIC-RISE-2016-Report.pdf.